-- the front band is approximately 0.080" long. Supposedly the "authentic" Keith 35 bullet had a 0.100" long front band. -- the bottom band is 0.113" long. -- the lube groove is 0.120" long, if you measure it my way. 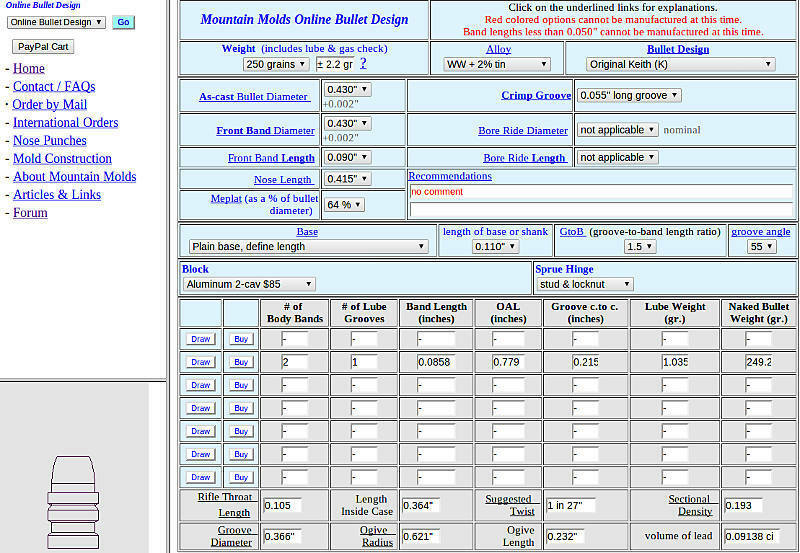 -- the nose length is 0.375" or 1.04% the bullet diameter. 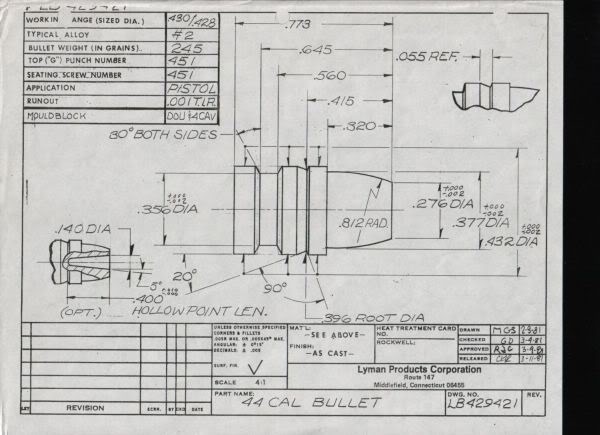 Supposedly the "authentic" Keith 35 bullet had a longer nose, possibly 0.445" long, intended to work with 38 special cases. -- the lube groove angle is 60 degrees included. -- to my eye it looks like there is a straight section before the ogive begins, but it's not called out on the drawing. -- the front band looks to be approximately 0.090" long. Elmer may have preferred it 0.100" long. 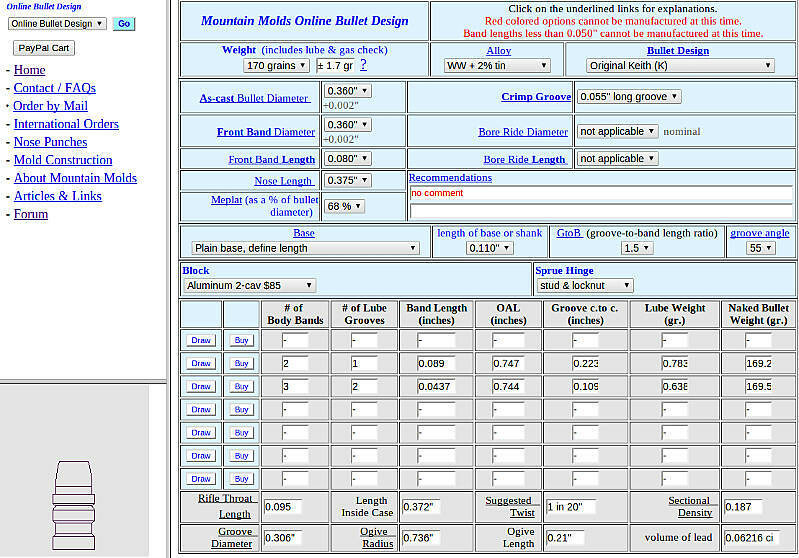 -- the bottom band is 0.107"
-- the lube groove diameter is 83% of the bullet diameter. -- to my eye it looks like there is a short straight section before the ogive begins, but it's not called out on the drawing. 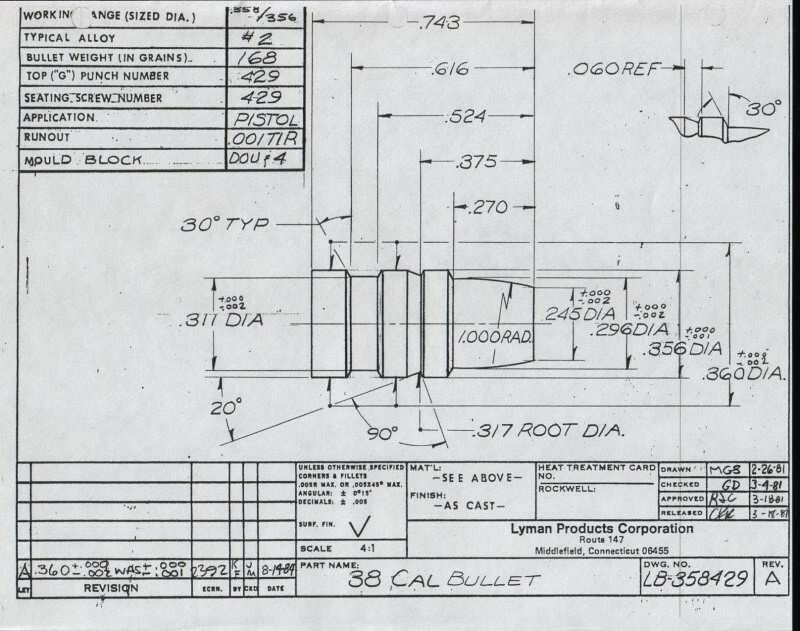 And here would be a very close copy of the Lyman 429421. 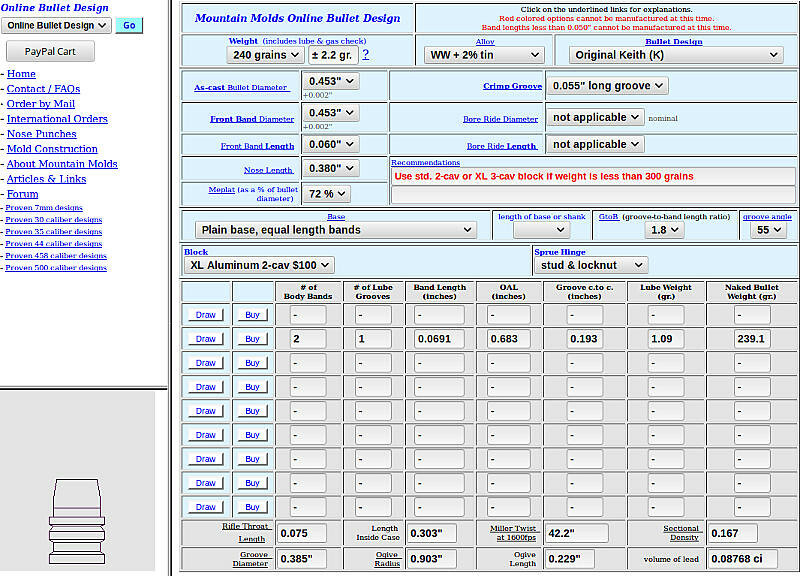 I think the only thing Elmer would change would be to make the front band 0.100" long instead of 0.090. Although Elmer often talked about "equal length bands and grooves," bear in mind that he was a cowboy not a scientist so when he said "equal length" what he really meant was "kinda sorta equal length to the naked eye" so I would take that "equal length" stuff with a grain of salt. Elmer never actually produced a blueprint of his "authentic" designs. Supposedly he did have some steel "master" bullets made, but the alleged masters have not been shown to the public as far as I know. I have a set of those prints given me by Lyman. You were probably the original internet source for those prints. And then there is the 452424. A pic borrowed from the Boolits forum showing various Lyman 452424's that have been made over the years. Will the real 452424 please stand up? Years ago someone sent me a sample bullet from an H&G mold that they claimed was the "real" 45 caliber Keith bullet. I have no way to know whether Elmer would have approved of that H&G design, but in any event it looked similar to bullets #2, 4, 8, & 9, counting from left to right, with a short squat nose, a generous flat bottomed lube groove, and skinny driving bands.